← Episode 95 – How cheap is too cheap? Why do I do this? It’s so simple and just about the same as every other site. You can sign up with your own email account or sign in with one of your other accounts. Check out the image below. As you can see, you can use your Google, Twitter or Facebook account to sign up as well making it just as easy to get up and running as any other site. I even think you can connect it to your Yahoo account. You also see a How to lino canvas down at the bottom of the image. This is a canvas that shows you all that you can do with Lino which is also a nice touch. Kind of a proof is in the pudding kind of an example. 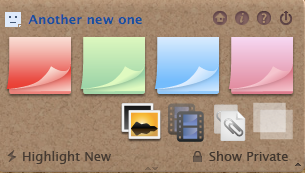 You can see there is a clearly defined button to click to create a new canvas as well. It’s kind of nice, but the help section is far more informative. When creating a new canvas you get the option of selecting the background (you can change this at anytime, so don’t lose any sleep over this) and then it appears. A blank canvas with two floating palettes and a hidden one. Check out the image below. The backgrounds are pretty good and sticky notes don’t seem to get lost or feel out place when looking at them on the different backgrounds. The palettes themselves cannot be moved which is a shame but at the same time I kind of get it. They want you to work around the palettes, not constantly managing the palettes. Anyone who has ever used an older version of Microsoft Office on Mac knows what I’m talking about. You would be constantly be moving, closing, opening, moving and so on, so I get it, but it still is something you are working around. However, all the palettes themselves are quite useful. 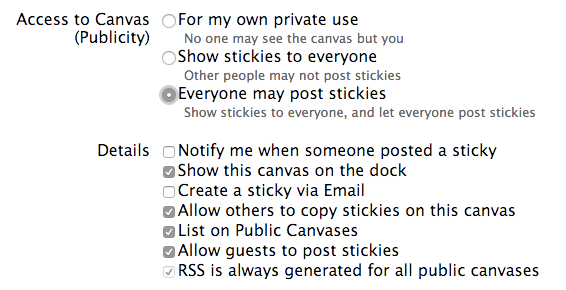 The sticky palette lets you add stickies to your canvas. You can also find links here to go home, get info about the canvas, access the help page, log out and two newer features I’ve not seen before. All in all they are all pretty useful and straightforward. Now onto those two unusual features. One is Highlight New. This feature will add a number to each sticky that shows the order in which they were added. Check out the image from another canvas I was playing with. Pretty handy, especially if you are a teacher trying to keep track of what was added first and so on. The other feature is Show Private. Basically when you add a sticky you can make it private. 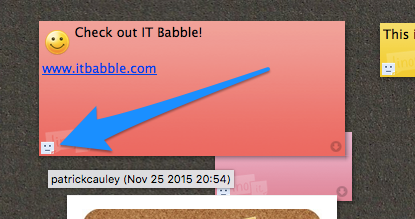 By clicking on and off the Show Private you can show or hide those stick notes. When they are “hidden* you see a translucent sticky but none of the info is present, even to you! The navigator let’s you quickly get around a large canvas which is handy. It is just like the navigator palette in Photoshop. The calendar is kind of interesting. It will show you important dates (like holidays), but it also has another function. On a sticky you can add a due date and it will be reflected on the calendar. Another interesting thing about the calendar is that it reflects important dates from all canvas, not just the one you are working on. That’s kind of neat. The canvas palette lets so switch between canvas quickly. 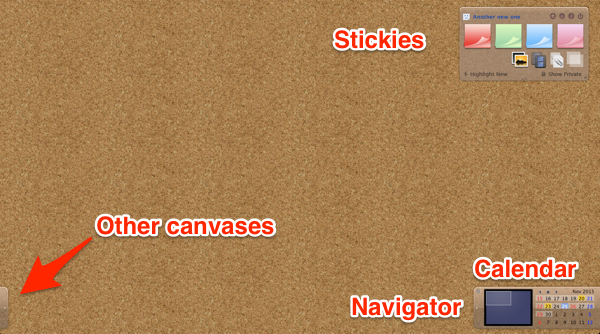 It also allows you to move sticky notes between canvases as well. Just open up this palette and you can drag a sticky right to the canvas you want it on. Again, this is a clever feature. 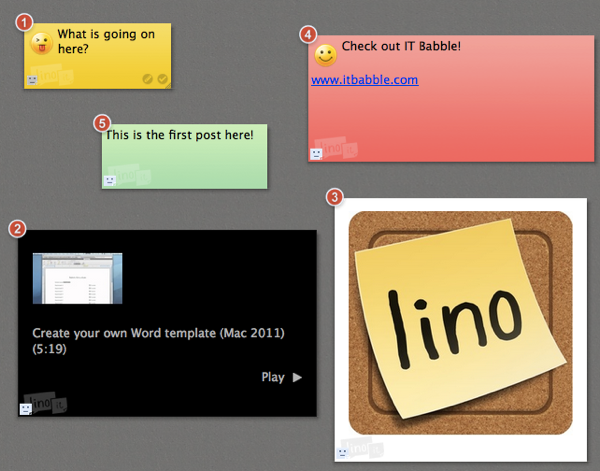 Now to the main feature of Lino, creating sticky notes on your virtual cork board. 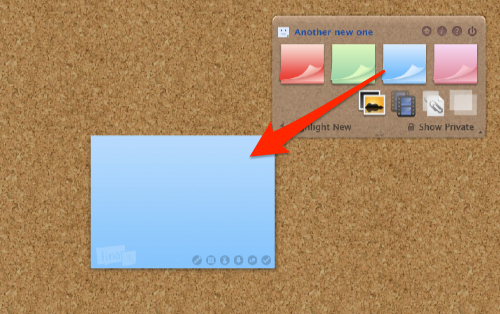 It is really easy, just drag a sticky note from the palette anywhere on the canvas. Don’t worry about the color you can change that at anytime and there are more than four options that the palette shows. 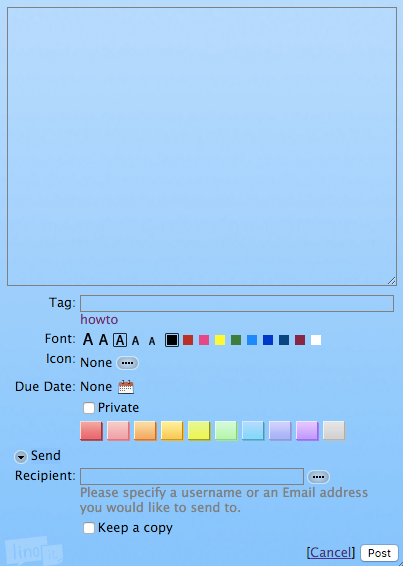 After you let go of the mouse (or trackpad) you can then add your message, due date, change the color of the note and font size and color as well. You can also make it private or not. 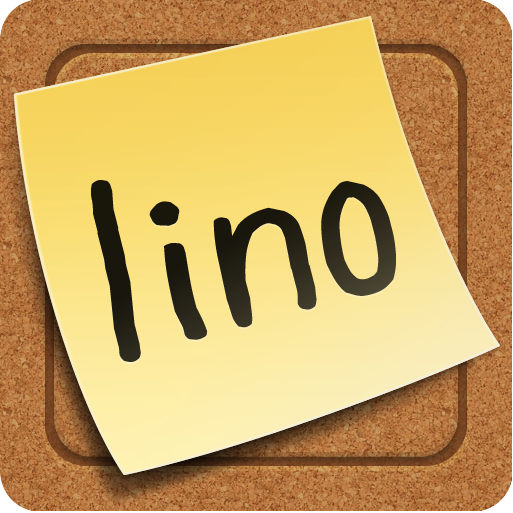 Again, Lino adds a nice feature. You can send this note to somebody. Be aware that when you do, the note will disappear from the canvas though. You can attach just about any file type to a sticky note as well, but with a free version you can only upload files 10 MB or less. There are plenty of ways around this, so it shouldn’t ruffle too many feathers. To see who made what sticky, just hove your mouse over the smiley face in the bottom left hand corner of the sticky. The name of the user will appear. The user can add a profile picture, but at that small size it is difficult to make out what it is. 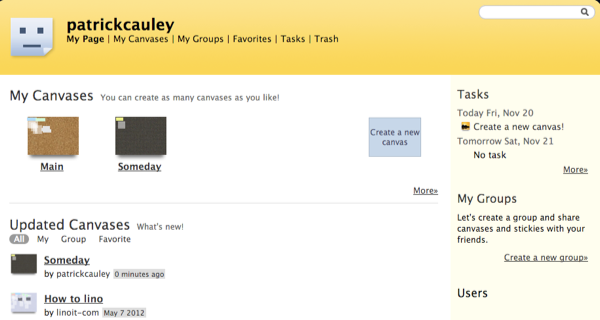 Like Padlet, many users can work on a single canvas at the same time. Also, like Padlet, you have no idea who is on your canvas at any given time and when changes are made to it, they are reflected pretty quickly but not as quick as Padlet does. It can take a minute or less for those changes to appear. The choices of who can do what are pretty basic. There is no moderation (at least none I could find), but you can set up notifications so when someone does post something, you get an email or a message in your dashboard. I wish there was a moderation option like Padlet, but as an administrator you can delete any sticky added to the canvas. Leno is very good and if you are thinking of using it for groups to brainstorm, to have people post their point of view, it could be good. It’s easy sign in, powerful and attractive feature set make it a winner in any classroom. This entry was posted in Patrick Cauley, Review and tagged Lino. Bookmark the permalink.